Created by premier boatbuilder Doughdish, Inc. This 2005 12 1/2 carries 140 square foot of sail with her main and jib. And flies a 140 square foot spinnaker. Beam is 5'10", her displacement is 1500 pounds and she draws 2'6" of water. At the time I took these photos, she was sailing in Southern Oregon at Howard Prairie Lake. The owner special ordered her and drove from Oregon to the Doughdish plant in Massachusetts. 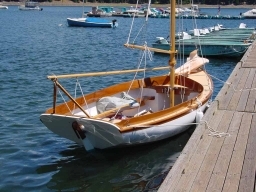 The Doughdish Herreshoff 12 1/2 starts at about $18,000.00. Then there is the trailer and other equipment. For current information contact Doughdish, Inc., 380 Wareham road, Marion, MA 02738 (508) 748-0334. Just for information, the day I photographed this 12 1/2 there were five adults and a little one comfortably seated for a day cruise on the Lake.